It’s likely not the birthday celebration James Freeman wished for. The Rome, Ga., resident spent Tuesday — his 31st birthday — slogging across 72 miles of icy metro-Atlanta roads for 12 hours after leaving Norcross at 2:30 p.m.
“Some called it ‘Snowpocalypse,’ others ‘Snowmageddon.’ I called it my birthday,” Freeman wrote in a first-person account for Yahoo News on Thursday. After learning of “grim” traffic reports that warned of “gridlock in every direction,” he spied a nearby Target store and hopped in to buy Cajun-style beef jerky, roasted peanuts, bottled water, and lighters. The next six-and-a-half miles took him seven-and-a-half hours. “Although my drive was less than fast, it was full of excitement. At one point, the man in the car next to me jumped out of his vehicle and made a pit stop in the nearby bushes. Additionally, I saw a group of mothers blocking the 400 south exit onto Holcomb Bridge in order to help their children's school bus get through the intersection and into the parking lot to unload the kids. In this encounter, there were plenty of curse words, middle fingers, and horns, but the mothers fearlessly stood in front of traffic to hasten the retrieval of their children. It looked dangerous but was fueled by motherly love. I was just glad to have a couple lanes between me and the raucous scene. 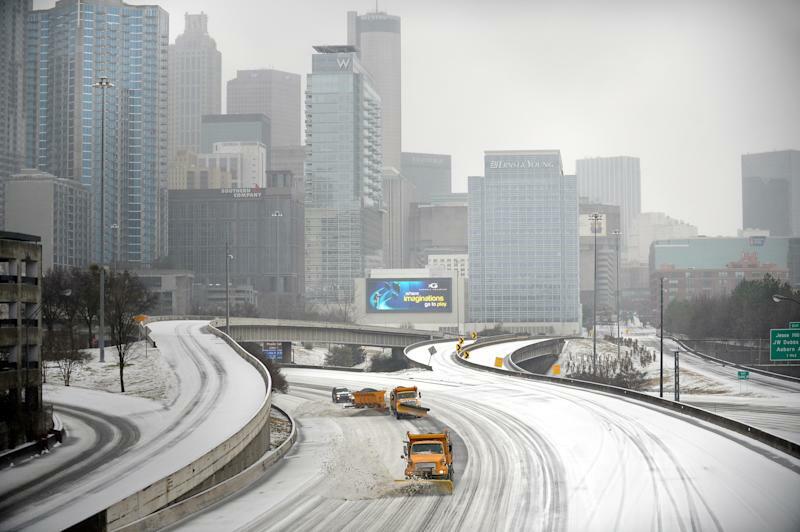 Here are more tales from this week’s storm that dumped three inches of snow on metro Atlanta, iced roads, canceled nearly 800 flights, caused roughly 1,200 accidents, injured at least 130 people, killed two, wrecked countless commutes and stranded thousands in local schools and businesses. On Camp Creek Parkway, there were enormous amounts of traffic, but I couldn't turn around to go another way. The traffic was at a standstill. I said to myself, Where are all of these people coming and going? It’s only 2:45 p.m. Little did I know my 15-minute drive home was going to turn into a four-hour nightmare. The traffic was “moving” at 5 mph, with large 18-wheelers turned over and others' cars in ditches; needless to say, it was cluster of accidents. I wasn't driving in the snow. I was driving on ice. Three hours later, I was two miles from home. At the intersection of Camp Creek Parkway and Campbellton Road, cars were piled up on top of cars. It was surreal; there was no law enforcement around to get motorists out of this mess. By 1 p.m. on Tuesday, it was obvious the snowfall was too steady for the predicted light sprinkling. It was really snowing, and I innately knew that Georgia was not prepared. I phoned my mother to see if her job was letting employees out early. "It's business as usual today," she said. But about three hours later she was stuck in the massive traffic jam that hindered commuters. Fortunately, she was able to get home in three hours instead of the 20-plus some Atlanta drivers endured. 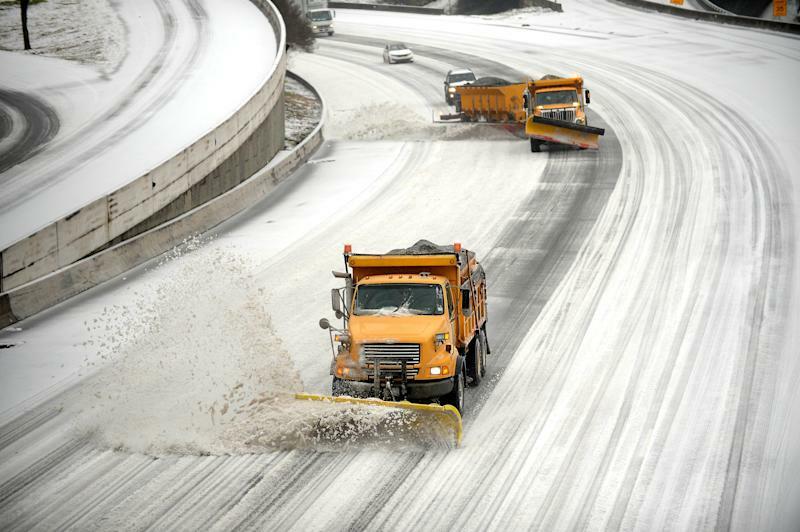 Public officials are dancing around key concerns of metro Atlanta citizens: What time had workers officially started pre-treating roads with salt? Who gave the official go-ahead for schools, government and private businesses to send people home at the same time? These questions haven't been answered. I thought Atlanta had learned from 2011's winter atrocity, but apparently not fully. My brother-in-law, Don, lives in Dalton. He drives an 18-wheeler. We were scrambling to reach him by phone. We reached him around 5:30 p.m.; he had been sitting on I-285 since 11:30 a.m.
At midnight he was still there. The law required him to get some sleep. There was a knock on his cab door — two motorists seeking warmth. By noontime he was moving. Under normal traffic conditions, he was an hour away from home. He arrived home safely seven hours later. He had spent twenty-four and one-half hours on I-285. My wife drove home around noon — first amazed at the snowfall – but suddenly the roads changed and she witnessed two accidents. Her usual 20-minute drive turned into a two-hour slog to get home. Our son spent several hours driving a few miles; he, too, saw numerous accidents. He lives nearby and still cannot make it home. Our other son works near Atlanta and it took him seven hours to drive seven miles. He finally had to park his car and walk the remaining three miles home. Fortunately, he plans for survival and had serious winter clothing in his car. My wife's brother did not have such good luck. He is handicapped so walking home is not an option for him. Before arriving at his home, his car slid down a hill. He was in an accident but able to continue driving. He tried several hotels and they were full. After spending the night with a friend, he finally got home Wednesday. Now that it has been two consecutive days of logjam, it's clear that as a state we should have heeded their warnings. Around 1 p.m. on Tuesday, before the ice storm really hit its stride, I was trying to get home from a grocery store that is only two miles from my house. It took 45 minutes to get home and in that two-mile stretch, there were four car accidents. The entrance to my neighborhood is a long, winding road and I also live in the midst of a steep hill, but luckily I made it back before the street became impossible to travel on. On Wednesday morning, I decided to bundle up and venture out on foot to see how the conditions on my main road, Highway 92, were. The walk was dicey because of the ice and my inadequate footwear, but I managed to get out of my neighborhood safely. As I progressed about a mile farther, I saw about a half-dozen cars that had been abandoned by the owners and have yet to be retrieved. 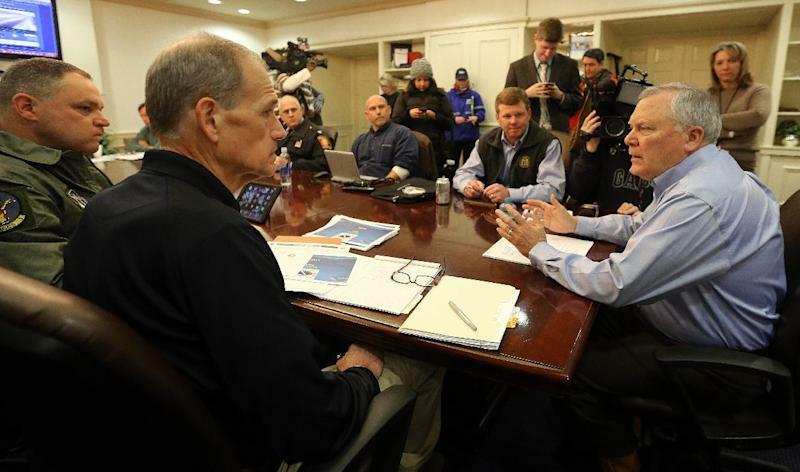 Many Atlantans saw the precipitation as an excuse to cut out from work early and schools to close shop. What ensued, however, was the beginning of massive hysteria. Some of the worst chaos and confusion was in Buckhead — right outside our front door. Our house is located off of Mount Paran Road and is very close to Roswell Road. Roswell Road connects to I-285, one of the main interstate highways that travels around Atlanta. Cars were backed up from the light on Roswell Road for miles. The snow froze so fast it was hard for cars to maneuver up and down the small two-lane road. Many drivers abandoned their cars to complete their trek home on foot. At one point in the night, two cars got stuck, and my roommates and I helped push their cars off the ice and directed traffic. Our neighbors handed out bottle water, gum and crackers to help those who had been stuck in their cars for hours. My parents were forced to sleep at a Waffle House and an office building, and my roommate’s parents slept at a hospital and a CVS pharmacy. No pictures or stories can describe the real panic from Tuesday.